BioGenerator creates, grows and invests in promising bioscience companies and entrepreneurs in the St. Louis region. The firm’s work spans the early-stage startup lifecycle of companies within the health and plant sciences. BioSTL, the parent organization, fosters collaborative efforts and builds regional infrastructure to achieve St. Louis’ potential in biosciences, assisting partner organizations that are advancing aspects of the overall regional strategy. BioSTL and its subsidiary, BioGenerator, brought NeuConcept onboard initially to help their portfolio companies develop their websites. We developed a streamlined website package for biotech startups and helped several startups build their websites using the WordPress content management system. 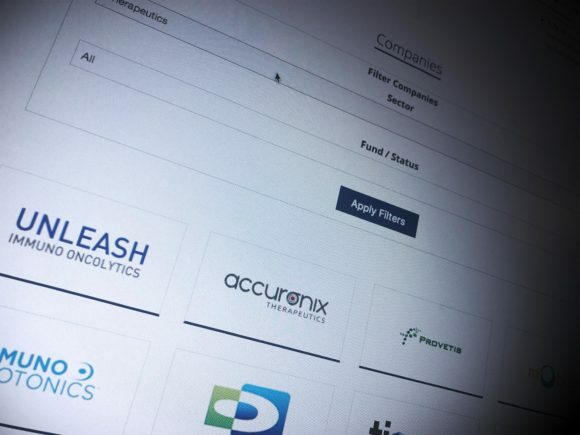 Since the websites of these biotech companies launched, they have now raised over $90 million in funding by investors and continue to grow. We continue to support many of these companies with website care and updates. BioGenerator also hired us to work on its own website, redeveloping its key landing pages and creating new filters, custom post types and queries for its database of portfolio companies. BioGenerator hired us to refresh the design and capabilities of its key landing pages and as well as make significant updates to its online portfolio company database. We added additional custom fields, updated taxonomies, and developed new queries so the companies can be filtered on the website by visitors. We continue to work with BioGenerator to update its website with new features and functionality. BioGenerator and BioSTL invest in promising biotechnology companies. Each startup needed a strong online presence to partner with and inform investors, the medical community and patients. But without an engaging website, these companies risked missing vital opportunities to engage their existing investors and draw new investors, collaborators and support for their potentially life-saving treatments. Start-ups we’ve worked with: Vasculox (now Tioma), Indalo (previously Antegrin), Tansna, Cellatrix, Accuronix, and KaloCyte. Implement a high-functioning, mobile-responsive site to engage and educate patients, the healthcare industry and investors. Successfully communicate online the company’s patients-first mission and commitment to developing effective, innovative therapies to combat critical disorders. Showcase break-through medical developments with clear content, appealing visuals and custom branding. Bolstered the company’s online reputation through articles, medical abstracts and links to industry and business publications.